The new starling resistance entrance holes (SREH) are new for Coates this year. This crescent shape design allows easy access to the martins, but keeps starlings out. This house and these types of doors are recommended to landlords that may have a problem with starlings. Made to fit TP-12 pole. Assembly Required. Choose from either of these three-piece telescoping poles with thumbscrew locks for your Coates and WatersEdge houses. 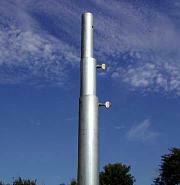 Both extend to just over 12' after installation. TP12 is made of 20-gauge galvanized steel and is recommended for the two and three-story houses. HD12 is made of heavier, 16 gauge galvanized steel and is recommended for the 4-story houses. Features 6" x 12" two-room suites for greater protection from predators and weather. Birds enter the inner nest room through another hole. Nest rooms have elevated subfloors. Louvered air vents and attic insulation provide optimal protection from temperature extremes. Each suite has its own private porch with guard rail. Hinged doors allow easy access and roof perch lets the birds sit on top of their 'mansion.' Houses are available in 4-, 6-, and 8-compartment models. Mount on one of the optional 12' telescoping poles. Made of durable, lightweight aluminum with a reflective roof. Available with starling-resistant crescent entrance holes only. Assembly required. Made to fit TP-12 pole. A mansion for serious landlords that is ready to attract and maintain martins. It comes with all the great features that Coates original houses are known for with 16 rooms that will welcome any martin colony.� Made to fit either the standard pole TP-12 or the Heavy Duty pole HD-12.� Assembly Required. Made to fit either the standard pole TP-12 or the Heavy Duty pole HD-12. Assembly Required. Introduced in the early 80's, this has been the cornerstone of Coates success. The features of the Coates original are all aluminum and stainless steel (no wood or plastic), hinged doors, ceiling plate, reflective roof, top perch, door plugs, metal base, ventilated roof, and all necessary hardware. � Made to fit TP-12 pole.� Assembly Required.